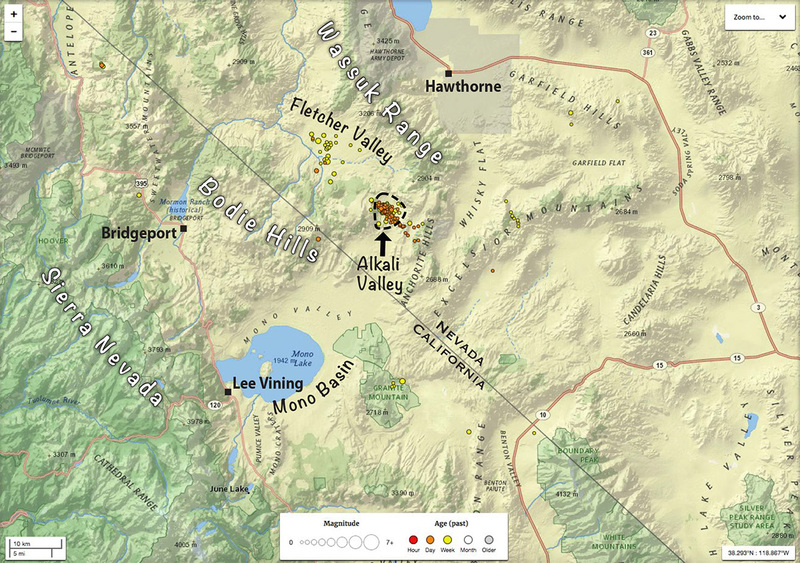 Late last December, three moderate earthquakes hit Fletcher Valley and rattled much of the eastern Sierra Nevada. An historic stone building at Ninemile Ranch was seriously damaged, and brick walls all around Bodie were tested for their strength. 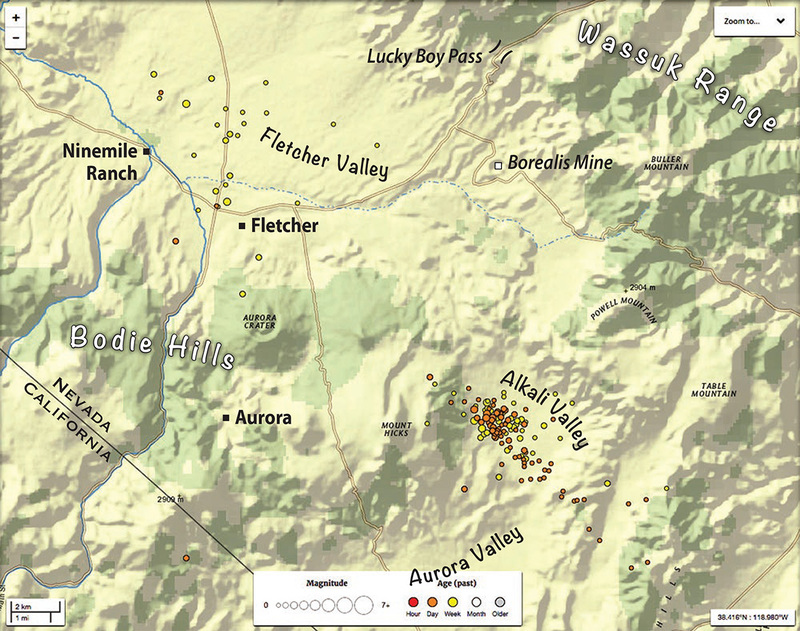 Every day since that event, very small aftershocks have continued to jiggle the valley east of the Bodie Hills. This week, another concentrated swarm of very small quakes (magnitude 0.1 to 2.6) has appeared under Alkali Valley, about 10 miles southeast of the Fletcher Valley epicenters, just east of Mt. Hicks, at the eastern corner of the Bodie Hills. The aftershocks have been tapering off in Fletcher Valley (only 28 in the last 7 days), but Alkali Valley has felt 120 tremors in just the last 2 days. The maps above and below are from the US Geological Survey’s “Latest Earthquakes” web map of the area (to which I’ve added some place names). Will Alkali Valley experience a stronger event soon—one that people in the area could actually feel? Maybe not. We’ll see. The region east of Mono Lake and the Bodie Hills is part of a seismically active region along the west edge of the Great Basin, known as the Walker Lane. Just 4 miles north of the Alkali Valley tremors is the most recent volcanic feature adjacent to the Bodie Hills—the late Pleistocene (less than 100,000 years old) trachyandesite lava dome of Mud Spring. Earlier in the Pleistocene, Lake Russel (the much larger ancestral Mono Lake) actually overflowed northward from what is now Alkali Valley, into Fletcher Valley and the East Walker River. Volcanism and uplift in the Mount Hicks area eventually raised the outlet higher than the fluctuating lake level, and a different spillway developed later, southeastward into Adobe Valley. This is an actively evolving terrain, even on a human timescale. That’s just one of the reasons I love the Great Basin and eastern Sierra Nevada landscape. UPDATE a week later: 204 quakes in the Alkali Valley area during the last 7 days. The strongest, magnitude 3.1.